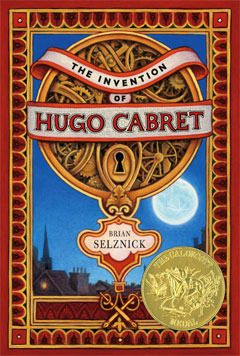 I just spent a few hours reading, enjoying, relishing The Invention of Hugo Cabret by Brian Selznick. Amazing. It's a story told in words and in pictures, where the pictures are sometimes just pictures and sometimes create a mini-movie inside the book. Did I already say it was amazing? The book tells the story of 12-year-old Hugo, an orphan who is a whizz at fixing clocks and anything mechanical. He manages to fix an automaton and through it discovers a picture that changes his life forever. It's a story of the magic that can happen in real life. There are also non-fiction elements to it, but I don't want to talk about details because they are not revealed until the second half of the book. Just know that there is some information on the beginning of cinema and that I now need to read something on the subject. The drawings are absolutely beautiful and I love the way each of them brings the story forward and then text takes over. Everything works so well together. "I like to imagine that the world is one big machine. You know, machines never have any extra parts. They have the exact number and type of parts they need. So I believe that if the entire world is a big machine, I have to be here for some reason. And that means you have to be here for some reason too." Now, why did I call this post 'pure indulgence'? Because I'm having a really bad week, which is why I'm at home able to read books. I almost fainted at work on Tuesday plus had an anxiety attack and was taken to the emergency room. I seem to be ok for now, though I have to get some tests done, but it was scary and I'm at home resting for a while. The most likely reason for it is stress and fatigue, fingers crossed that's all it is! In college, I took a class on classic French literature, so a lot of what was discussed in this book was something I had learned about before. That really enhanced the pleasure of the book! I'm sorry to hear about your work stuff, and I hope you're okay! This book sounds exactly what you need! Books of this kind are really the best way to counter the effects of a horrible day/week... Take good care of yourself! It seems indeed the perfect book for you today! I wonder if the movie was as good as what you describe - somehow I doubt it. I'm so glad you had a great book to indulge in. I bought this for myself as a Christmas present, but haven't tucked into it yet. I'm holding off watching the movie until I get to it. Oh Joanna! I hope that you're able to get some relaxing in and take care of yourself!! 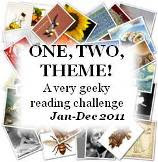 I really want to read this one. I fell asleep during the movie but it does have me curious! Amanda - Yes, I can see how that would make it even better. Patty - Books have great healing qualities, don't they? Larissa - I wonder too - I'm definitely going to see it! Kristi - It's terrifying alright! I'm trying to re-group and relax now, hopefully it won't happen again. Trish - Hmm, doesn't say much about the movie, hope it's still good and you were just really tired!